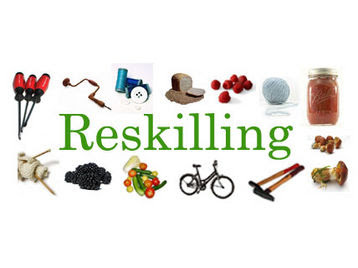 The TimeBank’s Spring Reskilling Expo on Earth Day, Saturday, April 20 from 10 to 3 offers classes on Graywater, Bokashi Composting, Chicken Keeping, Plant Propagation, Massage, Photography, Dreamwork, Poetry, and Boundary Keeping as well as a two-hour Repair Cafe. This year, we're opening our Reskilling Expo to the general public. NB: Space is limited, so preregeister early. Anne Berne: Anne has been caring for chickens for the past year-and-a-half. She is happy to share her mistakes, her successes, her environmentally friendly ways of raising chickens using a poop hammock, 80% pallet made with natural wood cure house, fermented food, steampunk veggie garden, zero electricity chick brooder and more. Note... there is a very serious bird flu virus going around, so she will not have any hands-on activities nor bring a chicken. Suzanne Schrag: Suzanne will demonstrate some basic ways to propagate perennials from cuttings. George Saitas: George will cover the basics for taking better photographs like composition, how lighting conditions affect your images and generally things to consider when trying to photograph something. Dana Taylor: Dena will read some of her poetry. Please feel free to bring your own to share! Caro Vitale: Thai Massage - Learn a short sequence to assist someone clothed and laying on their back to relax or be the receiver. Ellen Wild: Learn how to do seated Head and Shoulders Massage. Aude Castagna: We’ll discuss how to create and maintain good professional and personal boundaries with friends, neighbors and colleagues. Lois Robin: Dreamwork - How honoring our dreams can lead to new perceptions and directions in our lives. Bonnie Linden: A Graywater Laundry to Landscape System is the best way a household can save lots of water. Come learn how to do this simple DIY project to divert all the water from your washer to your garden. Bonnie Linden: Bokashi Composting is quick, easy and highly efficient. You’ll learn each step of this anaerobic fermentation process that quickly converts all food scraps (including meat, fish and bones) into a regenerative fertilizer. It's probiotics for your garden soil that your plants will love. We will have Bucket Systems and EM Mix for sale during the class. Repair Cafe Hosts: Stephan Bianchi, Evelyn Haynes and Ron Pomerantz. Stephan will be prepared to make simple repairs to lamps and small appliances like toasters, hair driers, Water Piks, etc. He can also repair bicycles and sharpen knives and scissors. Evelyn can address your Mac hardware and user issues. Ron is good at fixing lots of electrical and mechanical things. Members of the public must preregister to attend. Cost is $10 for one class or for the entire day. Registration must be completed by 5 pm on Thursday, April 18. Register early; space is limited. To register, use the PayPal Donate Button on this site to pay the fee. The PayPal account will say TimeBank Santa Cruz/Reskilling Expo. When we receive the payment, we’ll send you the address. You can leave a note indicating which class or classes you plan to attend and what you’ll bring to be repaired.